Figuring out whether your guinea pig is pregnant can be tricky, especially in the first few weeks of pregnancy. As the pregnancy progresses, you will notice both physical and behavioral changes. As long as you suspect your guinea pig is expecting, visit the veterinarian for an examination and confirmation. Pregnancy in guinea pigs is not always obvious. 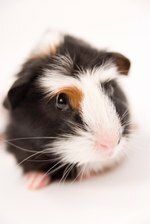 Guinea pigs reach sexual maturity at a young age -- 2 months for females and 3 months for males -- so it's important that you keep male and female guinea pigs separated if you don't want pregnancies to occur. But since guinea pigs are social animals, you'll want to keep them adjacent to one another. You might not notice many physical and behavioral signs of pregnancy in guinea pigs at first. From early on, though, your guinea pig will eat and drink more than usual. Guinea pigs need additional vitamin C during pregnancy, so you might see her favor fruits and vegetables high in vitamin C over those lacking it. After just a couple of weeks, you should notice your pet gaining weight, and the size of the abdomen becoming very noticeable. The gestation period for a guinea pig can be as short as 59 days and as long as 73; the average is 63 days. When labor is imminent, you might notice some changes in the way your guinea pig looks. Guinea pigs are not nesters, so you might not notice any changes in behavior as delivery time gets closer. You might, however, see a change in the width of the pelvis as delivery time approaches. This is visible in the external genitalia -- but the difference might not be obvious if you never paid attention to how the area looked before pregnancy. Babies are able to eat solid food and drink water just a few days after they're born, but if mom is around, they will also keep nursing for about three weeks. Babies are ready to be separated from mom -- and maybe adopted out -- after that. Females can get pregnant again within hours of giving birth, so it's important that you keep females and males separated at all times.